The buy & sell alerts come from Spectro’s™ algorithm interaction with price action. 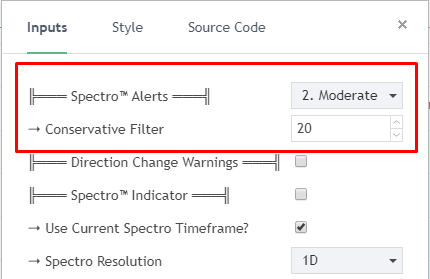 Many people ask what indicators Spectro™ uses, as a matter of fact, it doesn’t use any indicator. Long story short, we used neural network techniques to find patterns studying previous successful movements and then we compare real-time live data to the movements. Pretty much we studied hundreds of past movements and we figured out that in successful movements (success parameters should be set by whatever you call successful) you will find this ratio should return something close to 2. 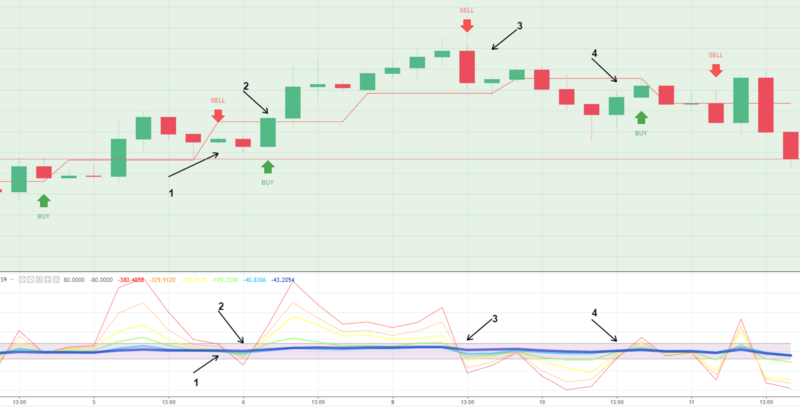 Let’s say (example), in successful movements we watched this behavior 80% of times: ((low[yesterday] + rsi[week]/2) + volume[week]/3 + (high[yesterday] + adx[week])/2)/ (high[today] + stoch[today] + close[today]/3) = 2. So it means that every successful movement should have the ratio close to 2, if it’s high up, let’s say 10 it means that statistically it’s too far up and it will probably correct to get closer to 2. If it’s -8 it should go up. That’s the simplest way to reveal how Spectro™ works without compromising our formula. Watch the crossing zones, when the most of the lines cross the blue “normal price pattern” line up it’s a BUY alert; if it crosses down – it’s a SELL. This is the “brain” behind the alerts you get on your chart. If you were 5 I’d say, when it’s red it goes down, if it’s green – goes up and if it’s blue, well, that means danger – reversal. You can turn the alerts on & off by clicking the respective checkbox. Spectro™ comes with 4 different types of triggering: Aggressive, Moderate, Conservative and Safest. Those modes affect Spectro™’s reactivity. This allows Spectro™ to adapt to whatever trading style, from scalping to long positions. The Safe Filter only works for the #4 mode, the safest. Bigger this number less reactive the triggering will be. You will have clearer alerts but slower entry/exit points. 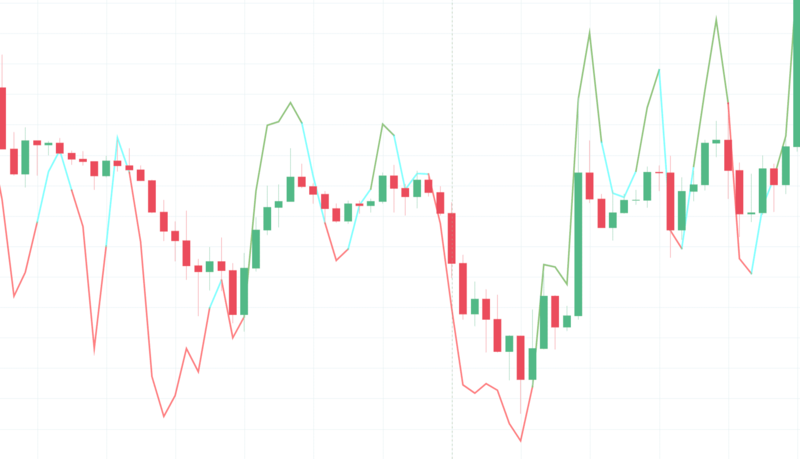 A feature very requested by the community and extremely flexible and powerful, it allows you to see what Spectro™ Indicator looks like in different timeframes in seconds – adding speed, extra safety and eases your confirmations. 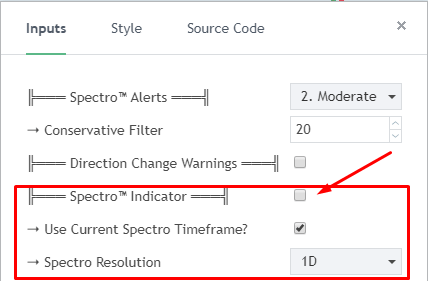 You can set Spectro™ to smaller timeframes when you spotted a trade and want to find a more precise bottom/top. Also, when you want to confirm a longer trend to see the probable direction, you can use longer timeframes alerts. For instance, If the last alert was a buy on the daily timeframe it’s a bullish day if it was a sell…well you get it!